My daughter loves to help me in the kitchen. I try to find recipes that she can help with. She’s 9 so it needs to be age-appropriate for her skill set. 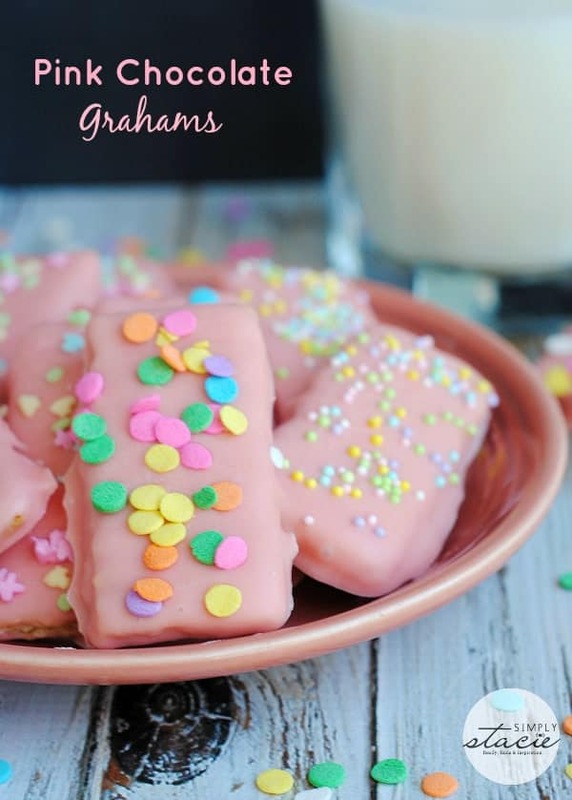 This recipe for Pink Chocolate Grahams is super easy, quick and fun! Kids can go wild with their imagination to decorate their cookies adding colours and making shapes and designs with their sprinkles. I thought they looked perfect for Easter. It’s not too often that you see pink chocolate right? Wilton sells pink chocolate candy melts. You can buy them on Amazon and they are also sold at Michael’s. Why buy cookies when you can make your own? Enjoy! The perfect, pretty sweet treat! In a microwave safe bowl, microwave the Pink Chocolate in 30 second increments stirring after every 30 seconds. Once melted let cool 1-2 minutes. Dip the graham crackers one at a time in the chocolate and completely cover, lift out with a fork and let the excess chocolate drip into the bowl. Lay on cookie sheet. After dipping 3-4 graham crackers sprinkle each graham cracker with the spring/Easter nonpareils before the chocolate sets. Repeat with all other graham crackers. These look awesome! Can’t wait to try them. You come up with some really cute ideas. It’s amazing how you can make a store-bought cookie elegant, updated, and fun. Plus, it’s a lot easier without having to do from scratch and cheaper than buying store decorated. Good memories for you and your daughter. Thank you. these look so great! Thanks for sharing all these great easter recipes! Very cute! 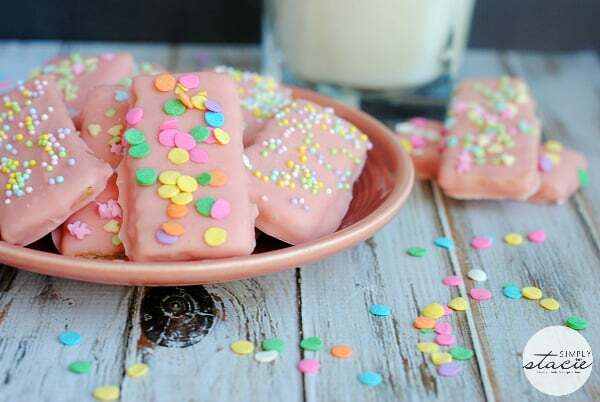 Love the candy melts, they come in very handy for doing creative things in the kitchen! I love that color of Wilton frosting~you come up with such cute and easy ideas. 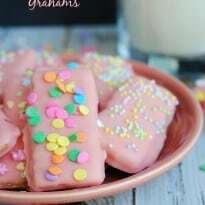 These pink chocolate covered graham crackers look very cute. I’ve got to be honest, if I were to make these I’d use dark chocolate not pink chocolate. Thank you for sharing this recipe. These are great looking for Easter time. 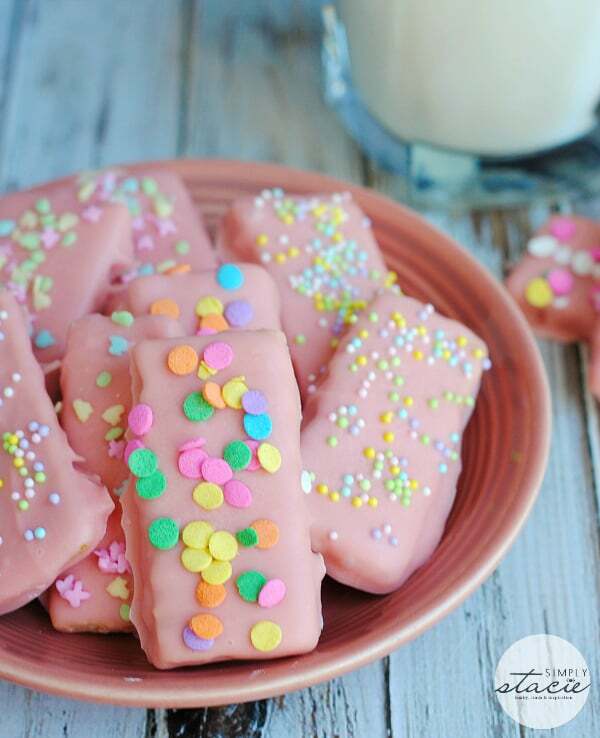 The grand kids all love graham crackers so they will love these. Just in time for the Easter holiday too. thanks for the idea and how to make them. These are so pretty and would be perfect for an Easter Treat. These are so pretty – perfect for a tea party with my girls! Ahh how cute! These would be awesome for a little girls tea party! They look so good and yummi! I’m going to do them with my 5 years old cousin, she loves baking pastries! I’m not a big fan of grahams, but can use this idea with any type of cookie. These are absolutely adorable for Spring and Easter! The recipe sounds so good and easy! Decorating with the spring/Easter nonpareils let’s yo put your own stamp on them too. 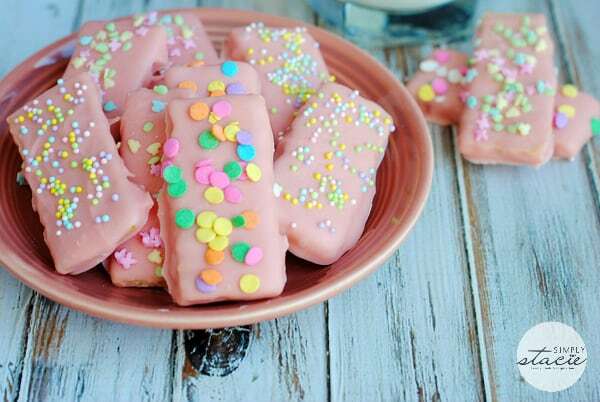 I would love to make some pink polka dot ones! Thanks for sharing! Wow these look Yummy and sooooooooooooooo Colorful!!!! Perfect for Easter. So pink and cute. These are so pretty to make for easter and they look deliciously tempting too.I love your ecipes you post. These look like they would make a great sweet snack. Thank you for sharing.